Background: Bosnia and Herzegovina’s declaration of sovereignty in October 1991, was followed by a referendum for independence from the former Yugoslavia in February 1992. 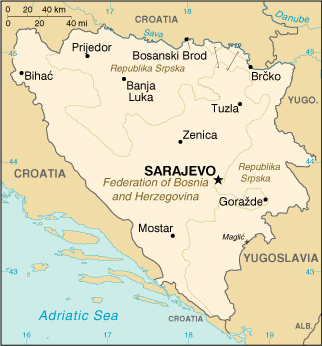 The Bosnian Serbs – supported by neighboring Serbia – responded with armed resistance aimed at partitioning the republic along ethnic lines and joining Serb-held areas to form a “greater Serbia.” In March 1994, Bosniaks and Croats reduced the number of warring factions from three to two by signing an agreement creating a joint Bosniak/Croat Federation of Bosnia and Herzegovina. On 21 November 1995, in Dayton, Ohio, the warring parties signed a peace agreement that brought to a halt the three years of interethnic civil strife (the final agreement was signed in Paris on 14 December 1995). The Dayton Agreement retained Bosnia and Herzegovina’s international boundaries and created a joint multi-ethnic and democratic government. This national government is charged with conducting foreign, economic, and fiscal policy. Also recognized was a second tier of government comprised of two entities roughly equal in size: the Bosniak/Croat Federation of Bosnia and Herzegovina and the Bosnian Serb-led Republika Srpska (RS). The Federation and RS governments are charged with overseeing internal functions. In 1995-96, a NATO-led international peacekeeping force (IFOR) of 60,000 troops served in Bosnia to implement and monitor the military aspects of the agreement. IFOR was succeeded by a smaller, NATO-led Stabilization Force (SFOR) whose mission is to deter renewed hostilities. SFOR remains in place at a level of approximately 21,000 troops. Government – note: The Dayton Agreement, signed in Paris on 14 December 1995, retained Bosnia and Herzegovina’s exterior border and created a joint multi-ethnic and democratic government. This national government – based on proportional representation similar to that which existed in the former socialist regime – is charged with conducting foreign, economic, and fiscal policy. The Dayton Agreement also recognized a second tier of government, comprised of two entities – a joint Bosniak/Croat Federation of Bosnia and Herzegovina and the Bosnian Serb Republika Srpska (RS) – each presiding over roughly one-half the territory. The Federation and RS governments are charged with overseeing internal functions. The Dayton Agreement established the Office of the High Representative (OHR) to oversee the implementation of the civilian aspects of the agreement. About 250 international and 450 local staff members are employed by the OHR. Economy – overview: Bosnia and Herzegovina ranked next to The Former Yugoslav Republic of Macedonia as the poorest republic in the old Yugoslav federation. Although agriculture is almost all in private hands, farms are small and inefficient, and the republic traditionally is a net importer of food. Industry has been greatly overstaffed, one reflection of the socialist economic structure of Yugoslavia. TITO had pushed the development of military industries in the republic with the result that Bosnia hosted a large share of Yugoslavia’s defense plants. The bitter interethnic warfare in Bosnia caused production to plummet by 80% from 1990 to 1995, unemployment to soar, and human misery to multiply. With an uneasy peace in place, output recovered in 1996-98 at high percentage rates from a low base; but output growth slowed appreciably in 1999 and 2000, and GDP remains far below the 1990 level. Economic data are of limited use because, although both entities issue figures, national-level statistics are not available. Moreover, official data do not capture the large share of activity that occurs on the black market. The marka – the national currency introduced in 1998 – has gained wide acceptance, and the Central Bank of Bosnia and Herzegovina has dramatically increased its reserve holdings. Implementation of privatization, however, has been slower than anticipated. Banking reform accelerated in early 2001 as all the communist-era payments bureaus were shut down. The country receives substantial amounts of reconstruction assistance and humanitarian aid from the international community but will have to prepare for an era of declining assistance.